The health of the retina is very dependent on a good blood supply to the eye. Diabetes compromises this circulation and can cause serious damage to the retina (diabetic retinopathy). Glucose is the main source of energy to the body. It is obtained from foods containing carbohydrates and we produce insulin to metabolise glucose and release it from the blood to body tissues. Diabetes occurs when insulin production is insufficient or fails and glucose levels fluctuate leading to poor circulation. Too much or too little glucose compromises red blood cells making them less able to carry oxygen and nutrients to body tissues. Damage follows as small blood vessels become distorted, blocked or leak into surrounding tissue. New blood vessels can also be formed but these have weak walls and can easily bleed. All these changes are observed in the eye and can lead to serious vision loss. Diabetes can be an inherited defect (Type 1, 10-15%) or acquired (Type 2, 85-90%). Family history of diabetes is significant. Increased risk occurs with Aboriginal or Pacific Islander, Indian or Chinese heritage. Pregnancy can be accompanied by gestational diabetes. The more common Type 2 Diabetes is increasing, particularly with sedentary life style and western diets. It is estimated that 2 million Australians will develop diabetes and that 60% can be prevented. There are many risk factors some of which can be modified to reduce the risk of tissue damage. The most common risk factors are increasing age (<50yrs), diet, lack of exercise, excessive weight, smoking, raised blood pressure and elevated blood fats. Symptoms include thirst, hunger, blurred vision, headaches, dizziness, pain or tingling in the legs or feet, weight changes, skin rashes and poor wound healing. 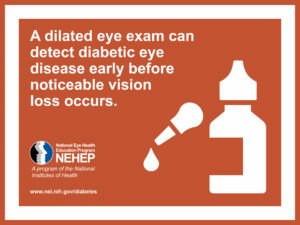 Early symptoms may not be obvious and the first signs might be seen during an eye examination. Variable blood sugar can cause early fluctuation in vision and in the long term, can cause serious vision loss through damage to the retina. The retina is also the only place where tiny blood vessels can be easily examined. 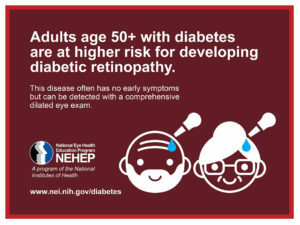 A detailed examination of the retina is part of a full eye test and is an important component of ongoing management of diabetes. The full range of vascular changes can be seen in the retina. Early changes (background retinopathy) are subtle, without obvious symptoms and can be stable with good blood sugar control. Regular monitoring with detailed retinal examination may be all that is required at this stage. Progressive (proliferative retinopathy) is more serious and can lead to bleeding, tissue swelling and new blood vessel formation. Referral to a retinal eye specialist for treatment is indicated when progression is noted. To help prevent the onset of Type 2 Diabetes you should maintain a healthy body weight, participate in regular physical activity, make healthy food choices, manage your blood pressure and cholesterol levels and avoid smoking. Diabetes needs life-long management to prevent ongoing damage. Early diagnosis, reduction of risk factors and ongoing treatment are very important in preventing complications. 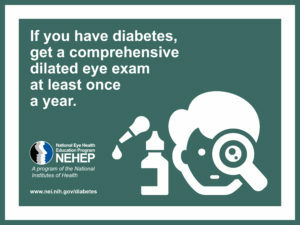 Your optometrist is an important member of the health team monitoring diabetic patients. Our optometrist Yang Wang routinely conducts annual checks for diabetic eye diseases including diabetic retinopathy, diabetic cataracts and diabetic macular oedema. At the end of each exam a report will be sent to your managing GP and endocrinologist.